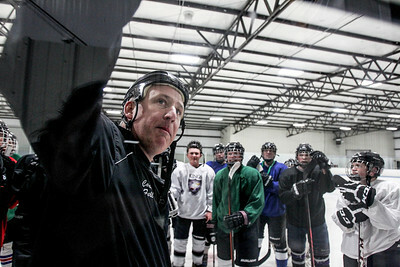 Kings hockey players listen to their coach during practice at the Crystal Ice House in Crystal Lake Tuesday, April 29, 2014. The Kings hockey program is a co-op team made up of Jacobs, Dundee-Crown, Hampshire and Huntley. This is the only team in the area that plays high school and club together, creating a cohesiveness during a year when the players will play around 65 games a year together.